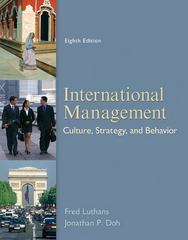 International Management: Culture, Strategy, and Behavior 9 Edition International Management: Culture, Strategy, and Behavior reflects new and emerging developments influencing international managers. With integrated real-world examples, research, and practical applications, students understand how to adjust, adapt, and navigate the changing global business landscape and respond to global challenges - making it a market - leader. The authors retain research and practices over the past decades, and incorporate new and emerging developments affecting international managers to increase students' effectiveness in managing across cultures.